It’s completely true that de-regulation by governments (and possibly to some extent the wrong kind of regulation) caused this crisis. It’s true that bankers and mortgage brokers acted irresponsibly too in taking commissions and bonuses for short term gains from loans and mortgages which they knew were unlikely ever to be paid off. for the irresponsibility of the government and some very wealthy people. The banks and the stock market traders have been utterly irresponsible , have lobbied governments to de-regulate – and governments – Republican and Democrat, Conservative and Labour, have irresponsibly agreed for the last 28 years. When the banks fail they believe they can blackmail taxpayers into bailing them out to prevent them dragging the whole economy down with them. This has happened many times around the world with Hedge Funds and other financial institutions. So ordinary people on both sides of the Atlantic have been understandably angry at their taxes being used to bail out the wealthiest people in the country, on the basis that it isn’t fair – and they’re right it’s not. Opponents of the bail-out also point out that if their own small business went under the government wouldn’t bail it out. So why should their taxes help bail out big banks or the results of governments’ decisions they ask? The bail-outs have to go ahead though because otherwise panic will continue to spread and more banks will collapse and more people will lose some or all of their life savings or their jobs or their houses. The Great Crash of 1929 started with a rumour about one bank. People began to panic and soon everyone with money in that bank withdrew it all at once. Every bank gives loans and mortgages which total more than the amount of money deposited by their customers. This doesn’t really have any harmful effects as long as most of the banks customers don’t come and demand to withdraw all their money at once (which they almost never do). This may sound worrying as there’s a certain amount of ‘imaginary’ money involved. However this is usually loaned out to people who have just bought a new house and will eventually pay off the mortgage plus interest, or who are setting up a new business or developing a new technology which will create lots of new jobs in the long term (and also repay the loan they took out plus interest). So the ‘imaginary’ money actually allows the ‘real’ economy to grow faster (and when it comes right down to it all money and the value of everything is a matter of how much people will pay for it at that moment). It’s true that many mortgages and loans were made to people who couldn’t afford to repay them. While many of them have been asked to take ‘their share of the blame’ it’s unlikely that they would have taken on debts they could never repay or ‘variable rate mortgages’ (i.e low interest rate at the start, then it rockets up after a couple of years – or according to variation in base interest rates) if the people selling them to them had told them the full facts and all their options (e.g to take out a fixed rate mortgage). Since the mortgage brokers often got a commission for each mortgage they got someone to take out the long term consequences weren’t of much interest to some of them. Some also claim that government regulations in the US which required banks and other lending institutions to give a certain percentage of loans and mortgages to people from ethnic minorities (mostly on lower incomes) and low income groups with little collateral (i.e whose houses weren’t worth much). This may have been a factor, though companies in the past have been very good at evading regulations they didn’t like by interpreting them the way they wanted to – so it’s unlikely banks gave out many such loans unless they also wanted to because they valued short term profits over long term consequences. So the Democratic leadership in congress (including Senator Obama) demanded that any deal include proper regulation and oversight of the financial industry to prevent a repeat of the crisis. They also demanded that it include some protection for people with mortgaged houses and the condition that when the banks start making a profit again they’d have to start using some of those profits to re-pay the loan from the government – and pay interest on that loan. They also included conditions limiting pay and bonuses for bank managers, so they couldn’t continue rewarding themselves despite having created an international disaster. There’s no way they could have justified the initial Bush administration plan – which was that tax-payers give the banks a $700 billion blank cheque, with no new regulation, no conditions, no safe-guards for debtors or mortgage-holders – many of whom would risk bankruptcy or losing their home after their taxes paid to bail-out the banks and building societies. This was agreed on by the Bush administration and the leaders of both parties in congress. Yet when it came to the vote two-thirds of Republicans and one-third of Democrats voted against the bill. So why did so many congressmen vote against the bail-out bill? Some Republicans voted from an extreme ideological ‘free market’ view-point which argues (against all history and the Great Depression) that all problems in the economy are caused by government regulation and so the best thing to do is let the wonderful free market fix itself or ‘make an adjustment’ auto-magically. They see any government regulation of or intervention in the economy as a ‘restriction on freedom’ or even as ‘tyranny’. The trouble with this is that, as the Great Depression and John Maynard Keynes showed, the ‘adjustment’ may be to a new equilibrium by itself, but that may well be one in which many more people are unemployed and the economy is much smaller due to a vicious circle of unemployment reducing the amount of money spent causing more unemployment. Unemployment, extreme poverty and dying young after suffering those and resultant stress, malnutrition and illness are a much worse form of ‘tyranny’ than regulating the economy could ever be. Senator John McCain even backed a plan by some of the right wing among Republicans in congress which contained no provisions for any of the $700 billion ever to be repaid, no protection for people with mortgages or loans that might get called in after the bail-out and a suspension of capital gains tax for 2 years – basically another tax cut that would mostly benefit only the very wealthy. This also almost sabotaged the deal that had already been agreed. Then McCain pretended he had tried to ensure ordinary taxpayers were protected. Some Democrats probably similarly had an ideological view that it’s unfair for ordinary people to have to bail out the wealthiest. While I’ve sympathy for that view-point the trouble is that if there isn’t a bail-out then almost everyone will suffer from the likely economic collapse – from the richest to the poorest. In 1929 when the Great Crash in the stock market took place many people were unconcerned and thought the bankers had got what they deserved – only later realising they had lost most or all of their own savings as a result. Some Republican leaders blamed a ‘partisan’ speech before the vote by Democratic Party House Speaker Nancy Pelosi which had blamed the Bush administration. While this may have been a factor I’d have to agree with the Democrat who said it was ‘unbelievably petty’ to decide to punish the whole country because your feelings had been hurt by something someone said (I’d only add it’s likely to punish people in other countries too). "Those who understand that taxpayers will eventually get much of the money back support the bailout by a 2-to-1 margin. Those who incorrectly believe the government will not be getting money back oppose the bailout by a 62% to 18% margin"
It’s been shown over and over again through-out history that companies and banks and markets which aren’t regulated by governments collapse and destroy themselves sooner or later – and that the only solution is government intervention and then re-establishing regulation. The suffering caused by economic collapse itself is bad enough – as with the mass unemployment, poverty and hunger of the 1920s and early 1930s. A soar in support for extreme undemocratic political movements – fascism, communism and Nazism – followed (Poverty and suffering caused by civil war in Afghanistan and dictatorship and economic sanctions in Iraq have had similar effects). Then, when enough people were desperate enough to support any party that would intervene in the economy and give them an income from a job or welfare those extreme parties came to power. Then they started World War Two. What began in 1929 with the Great Crash of the stock market in the US has come close to happening in the present – but this time we know what we should do to stop this disaster and what will make it worse. We can still prevent it. Extreme ideologies should not be allowed to blind us to the lessons of the Great Depression – and those manoeuvring for votes in an election year should consider what the result may be if they play chicken with one another for too long. Those congressmen who vote against a deal may gain votes in the short term – but if their actions prevent a bail-out and lead to most of their voters losing their jobs, their houses and their life savings those members of congress can be sure it won’t be long till they’re kicked out of office and replaced by the same voters with someone who will intervene to protect their interests. Members of congress have also been contacted by massive numbers of voters from their districts asking them to vote against the bail-out. If they continue to get a majority of congress to vote down the bail-out though then they all risk losing their own jobs, investments, pensions and savings the same way people did after the 1929 crash. The Rasmussen poll shows Americans who know what the bail-out bill includes are for it by a 2 to 1 margin. Only among those who wrongly think it's a blank cheque is there a majority against it. So those who're for the conditional bail-out need to contact their congress-people asking them to vote for the bill - and set up their own blogs and websites campaigning for it, so congress people don't get the false impression that most people oppose it just because its opponents are the most vocal. The bill includes full eventual repayment of the $700 bn – plus interest; it protects people in debt or with mortgages; it regulates the banks so this can’t happen again; it limits bank managers’ pay and bonuses so they aren’t rewarded for this. It’s the smart thing to do. It doesn’t let the big money institutions blackmail us into giving them a blank cheque, but it means we don’t all go down with them either. Voters in the US could even demand that when some of the banks start making a profit again and the government starts taking a share of those profits in repayment that it then return that money to every US citizen in equal payments, much like the one-off, token 'economic stimulus' payments to every American made by the Bush administration, but continuing until the $700 billion plus interest is re-paid. Blair’s recent appearance on the Daily Show showed that he still has his facts wrong and his theories are still delusional. He learned nothing in his decade as Prime Minister, yet Yale University is now letting him teach undergraduates who are being groomed to run Washington’s foreign policy. After seeing Tony Blair interviewed on the Daily Show it’s clear that not only was he ignorant on foreign policy on coming into government – but that he’s managed to maintain either total ignorance even after a decade’s experience as Prime Minister – either that or he’s very dishonest. On one visit to Iran in 2006 Blair was asked by an Iranian student who Mohammed Mossadeq was. He replied that he had no idea. Mossadeq was the first (and only) democratically elected Prime Minister of Iran after World War Two. He was overthrown in 1953 by the military dictatorship of the Shah with aid from the CIA and MI6 after Mossadeq’s government put forward a bill to nationalise Anglo-Iranian oil (now BP) when that company refused to give a fair share of profits to Iran in taxes or to increase wages for its Iranian employees – who lived in wooden shacks on slave wages. the UK's Channel 4 News anchor John Snow has also said Blair had no idea who Mossadeq was in conversations (1). On the Daily Show on Friday (19th September) Blair told John Stewart that Hamas, Al Qaeda and Iranian backed Shia militias are “all part of the same movement” which we’re fighting “in Iraq and in Afghanistan.” (2). No-one can have told Hamas, who were involved in a fight against the Al Qaeda inspired ‘Army of Islam’ in Gaza on 16th September (the day before the interview). Several people died (3). Blair is relying on the (highly unreliable) claims of the Israeli government and Mahmoud Abbas of Fatah, the latter being involved in a civil war with Hamas. Previously Israel have said Fatah are linked to terrorism and not to be trusted – but after Hamas’ election victory the propaganda line changed and Fatah became ‘the forces of peace’ as Israel allowed Egypt to arm Fatah forces with AK47s by the thousand (4). Blair did concede that many members of Hamas merely wanted a Palestinian state – but rather than thinking we should negotiate with them to isolate any who might want to ally with Al Qaeda he seemed to think a strategy treating them all as part of Al Qaeda was the best one – a strategy calculated to try to create a self-fulfilling prophecy of the worst possible outcome. Blair was certainly right that there are Iranian backed militias in Afghanistan and Iraq, but the ones in Afghanistan are our allies. They’re members of the ‘Northern Alliance’ (or United Front), our allies against the Taliban. The Shia militias in Iraq are fighting both our forces and Al Qaeda. Neither they nor the Iranian government are allied to Al Qaeda, who follow an extreme version of Sunni Islam. Some in Al Qaeda see all Shia (like the Iranian regime) as heretics to be slaughtered. So there’s no love between Al Qaeda and the Iranian government (5), (6), (7). So once again Blair’s conspiracy theory about all Islamic fundamentalist groups and governments being one undifferentiated enemy that we have to fight as if they were all part of Al Qa’ida looks not only totally wrong but also the worst possible advice to follow. Bush, Blair and Cheney have always been out of touch with reality though. They backed Musharraf as military dictator of Pakistan and heaped him and Pakistan’s ISI military intelligence with vast amounts of money in military aid while both double-crossed them by continuing to train, fund and share intelligence with the Taliban as their counter to the Indian backed Northern Alliance in Afghanistan (8), (9), (10). At the same time Musharraf and the ISI followed past western-backed military dictators of Pakistan by backing Islamic extremist parties and armed fundamentalist terrorist groups in Pakistan itself to try to keep civilian politicians getting power back from the military government. They did the same in Kashmir and India as part of their crazy attempt to defeat the much stronger Indian military by the indirect approach of backing terrorist groups (11), (12), (13). If you feel charitable towards Tony Blair or Bush or Cheney you could say they’re all ignorant or mistaken on all these points. If not they’re outright liars who are deliberately dumbing down the world. Either way it’s a big mistake to treat their wildly inaccurate claims and theories as a guide to policy. They are no wise elder statesmen but the joint architects of one bloody disaster and loss of human life after another. Despite this Blair has not only been appointed Middle East Peace Envoy for the G8 but Yale University have also given him a position as a lecturer, but that’s obviously not because he has much to teach anyone – except how to obey orders from the right wing of the Republican party and the big multinational oil and arms firms, no matter the cost in other peoples’ lives. That can’t do anything but make people wonder whether experts who graduate from Yale University in the future are knowledgeable about anything except doing what they’re told. Blair was dangerously unqualified to be Prime Minister not only because he didn’t know any, even recent, history of the Middle East but also because he had no interest in learning about it and based his actions on whatever conspiracy theory he could cobble together to justify doing what whoever happened to be President of the US at the time wanted to do. He’s dangerously unqualified to be a Middle East Peace Envoy for the same reasons. He has nothing to teach potential future politicians except as an example of what terrible mistakes and delusions to avoid. The above sign was placed by one Andy Lacasse - a 78 year old Korean war veteran living in Florida. We can clearly see his racial superiority not only in his confused belief that Obama is a Muslim (he has in fact been a Christian all his life) but in his awsome inability to distinguish between a religion and a type of cloth. "I got nothing good to say about Obama. If I see anybody touching that sign, I got a club sitting right over there."(1). Eloquently put, sir. Eloquently put. During the Korean war other veterans and historians say they obeyed orders from the highest level to shoot unarmed refugees by the thousand while sergeants screamed 'kill 'em all'; men, women, children - all unarmed. Still - they weren't the same race as Andy Lacasse. Not even half-breeds. 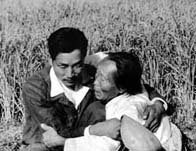 Just 'gooks' - a term of abuse that developed first in World War Two and the Korean War - and continued during Vietnam. Some other veterans still have nightmares about it (2), (3). According to US veterans of the Iraq war the equivalent form of abuse which US army recruits are encouraged to use is 'Hajii'; so if an Iraqi civilian is killed it was 'just a Hajii' , not a human like one of us (4), (5). At least three hundred civilians were killed in the US assault on the Iraqi town of Fallujah in April 2004 alone, many killed by American snipers targeting ambulances and civilians(6), (7). American veterans say they're still being killed by all sides - including Coalition forces - today (8). Obama has opposed the Iraq war from the start. McCain still supports it and Palin prays it is 'a mission from God'. 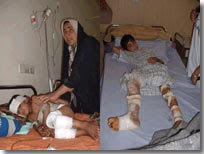 Iraqi children in hospital in Samarra after a US/Coalition/Iraqi government offensive in 2004. Of 70 bodies in Samarra General hospital on one day of the offensive 23 were children and 18 women (9). What's most inspiring is that this veteran of a 20th century war, living in the 21st century in a country where around a third of the population own two or more automatic weapons, has remained true to his racial heritage by relying on a pre-pre-pre-pre-historic weapon. Not a weapon used by those inferior homo sapiens hunter gatherers. No bows. No throwing spears or Atlatls. No - an honest to goodness club as used by homo habilis (handy man) before all those filthy homo sapiens began walking upright and making 'tools' and 'weapons'. Andy Lacasse is racially pure. Not a single human gene to pollute the knuckle dragging. Pure homo habilis. Even cave-men were racially impure compared to him - far too much human in 'em. What's even sadder though is that John McCain and Sarah Palin have not said they don't want racist votes. 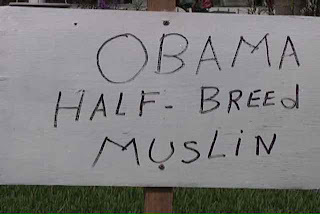 They've not made it clear that Obama is not and never has been a Muslim - or that most Muslims are not terrorists. They're quite happy to quietly allow racism and religious bigotry to be core planks of their campaign. In fact many of the lies about Obama, much of the bigotry, is spread by email by Christian fundamentalists in the US - people of similar beliefs to Sarah Palin who has said she prays that the Iraq war is a "mission from God" and whose minister (whose views she has not disowned) says that anyone who has criticised President Bush will "burn in hell". McCain and Palin are also happy to use sexism against Obama, with the sexist argument that women voters should vote for a woman rather than a man, irrespective of what policies they support and what policies the candidate supports (Palin's and McCain's policies mostly being the opposite of not only Obama's but also Clinton's policies). Racist votes, sexist votes, the votes of backward dinosaurs - they'll accept them all without ever criticising any of it - then they'll tell you they stand for principles and American values. If they really stood for American values wouldn't they tell racists like Andy Lacasse and the many like him, but less blatant, that they condemn all racism and bigotry and don't want the votes of anyone who's voting because of a candidate's race, religion or gender? Is this how the Republican Party really wants to end? On political life support from it's racist friends? Iraq veteran Joshua Key has a message for McCain and Palin. In his book 'A Deserter's tale' he wrote : "I never thought I would lose my country and never dreamed it would lose me. I was raised as a patriotic American, taught to respect my government and believe in my President.A decade ago I would have laughed out loud if somebody had predicted that I would live as a fugitive in my own country and turn my wife and children into refugees as I fled with them across the border"
If McCain and Palin are elected then real patriots like Joshua Key, who risked their lives for what turned out to be lies, will continue to be forced into exile, while racists prosper and pointless wars kill more Americans and more non-Americans alike. (8) = See (4) above and also http://www.duncanmcfarlane.org/who's_right_on_Iraq/bothsides/ and http://www.duncanmcfarlane.org/replytogray/Iraq/ and sources in links for both.